Not a big fan of their packaging. I noticed that, more people read my reviews when they are short and in bullet form. So lets forget about why I wanted this lipstick since I saw Nicki Minaj sport a similar shade and lets move on to the review. The actual color of the lipstick. Had to take this shot outside my window. COLOR: Bright Pink with a hint of blue. 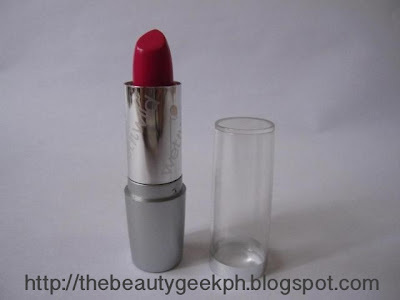 It is a cool toned lipstick that compliments people with fair skin and even those who are tanned like mine. 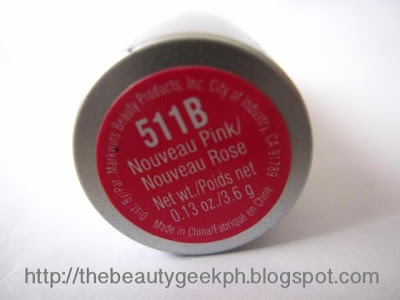 FORMULA: It has vitamin A and E which explains how smoothly it applies and why it doesn't dry out your lips like other lipsticks. 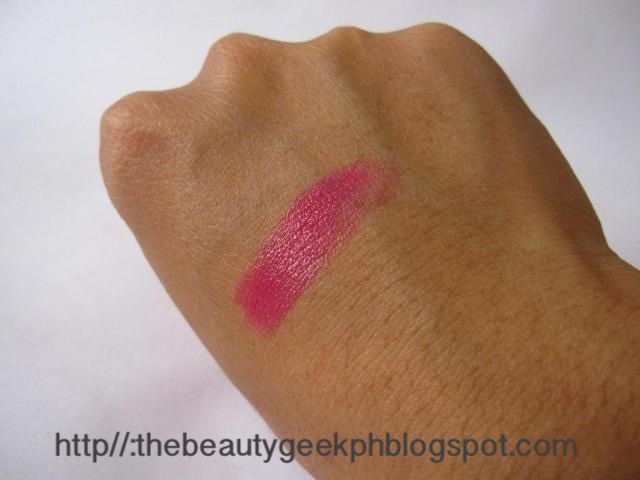 COLOR PAY-OFF: Very pigmented. It was the most pigmeneted of all the Silk finish lipsticks that I swatched from Wet n Wild. LONGEVITY: Lasts for 4 hours tops. You have to reapply when you eat or drink often too. PACKAGING: It is no fuss, and really simple. It is encased on a silver tube with Wet n Wild written all over enclosed with a clear cap. The problem with this is that, a portion of the lipstick is protruded which can create a mess if you don't close it carefully. But the clear cap helps you see the shade quickly without having to open the cap. AVAILABILITY: Womanity (Just click it! 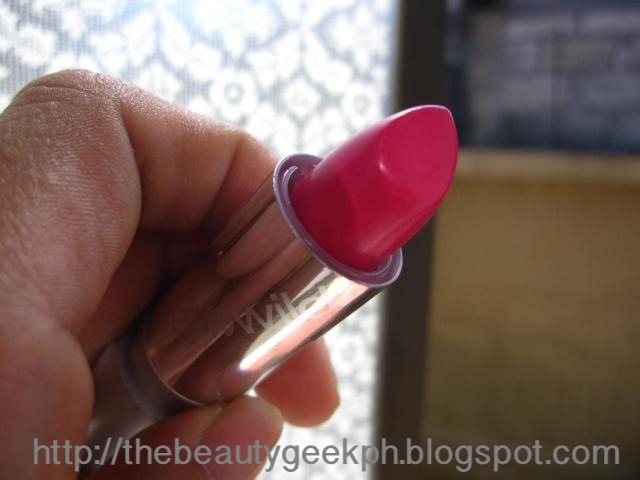 It would direct you to their FB page) is an online shop at Facebook who sells cheaper Wet n Wild products. They also have MAC lipsticks which I am eyeing right now and NYX products as well. They have the cheapest Wet n Wild lippies among all the online stores that I've come upon. Like what I said earlier, the packaging is a big downer for me because the product is protruded, hence, the possibility of smashing it by accident. But, who am I to complain? The product still delivers well despite the faulty packaging and the cheap price tag. Longevity. It lasts for 4 hours (tops) You have to reapply every so often when you have to drink and eat. The price! It is really cheap, considering how great this lipstick looks like when applied. It doesn't dry my lips and it applies smoothly you don't have to buff and prep you lips before swiping this lipstick on. It is really pigmented! It still covers my dark 'in-born' lip liner.Yeah, I have discolored lips, I look like I'm wearing a lip liner that doesn't match my lip color and I had it since forever. That's the reason why I get a hard time choosing lipsticks that work well for me. OVERALL RATING: I give it a 4 out of 5. It may not last long but for the price, this product really delivers well! What's your favorite pink lipstick? Hope you can share yours too!